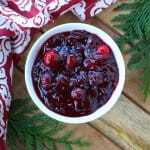 Get ready to impress your holiday guests with this delicious cranberry sauce! To make the base cranberry sauce, place the first four ingredients in a small saucepan and bring to a boil. Simmer for about 10 minutes or until soft and thickened. Add all remaining ingredients and simmer for another 5 minutes. Add a few more whole cranberries and simmer for another minute. Let the sauce cool to room temperature and then store in the fridge. Will keep for at least a week.